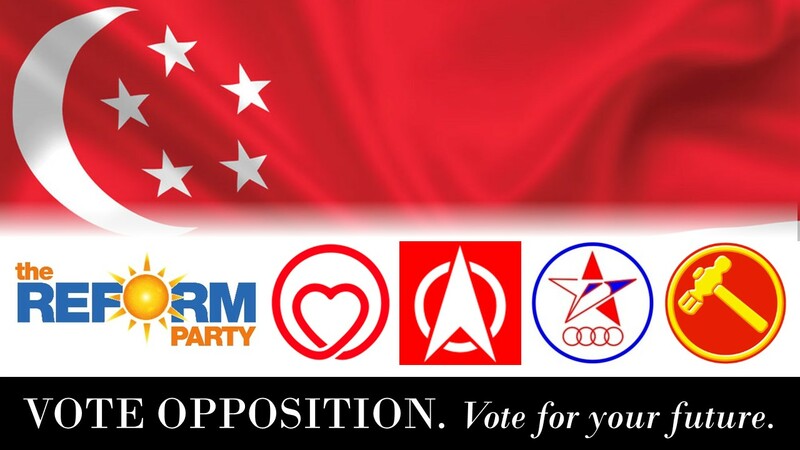 Vote Opposition to Protect Singaporeans. Vote for Your Future. 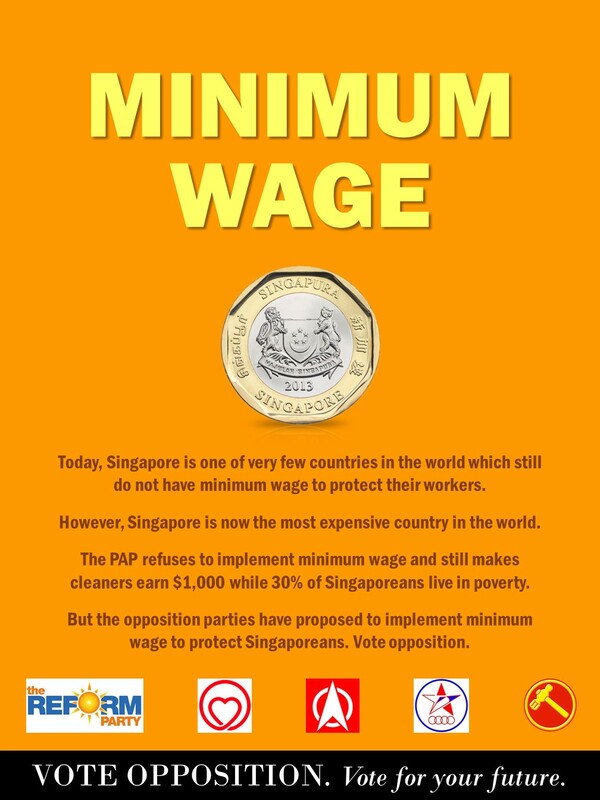 Today, the PAP refuses to implement a minimum wage to protect workers in Singapore. In fact, Singapore is one of very few countries in the world which still does not have minimum wage. As such, wages are so low in Singapore that low-wage workers earn the lowest wages among the highest-income countries even though Singapore has become the most expensive place in the world. The PAP will not implement minimum wage to protect Singaporeans. “A minimum wage policy will make businesses more judicious in employing cheap foreign labour and force them to upgrade the workforce. This has the effect of raising productivity,” said the Singapore Democratic Party. Yes, the opposition will implement minimum wage to protect Singaporeans. The opposition wants the livelihoods of Singaporeans to get better. Today, the PAP refuses to provide unemployment benefits to protect workers in Singapore. In fact, Singapore is one of very few countries in the world which still does not have unemployment benefits. Today, many Singaporeans have lost their jobs and have great difficulty making ends meet. However, not only does the PAP not want to provide unemployment benefits, it still wants unemployed Singaporeans to pay for their own health, education and retirement needs, so much so that many Singaporeans are made to struggle with their lives. 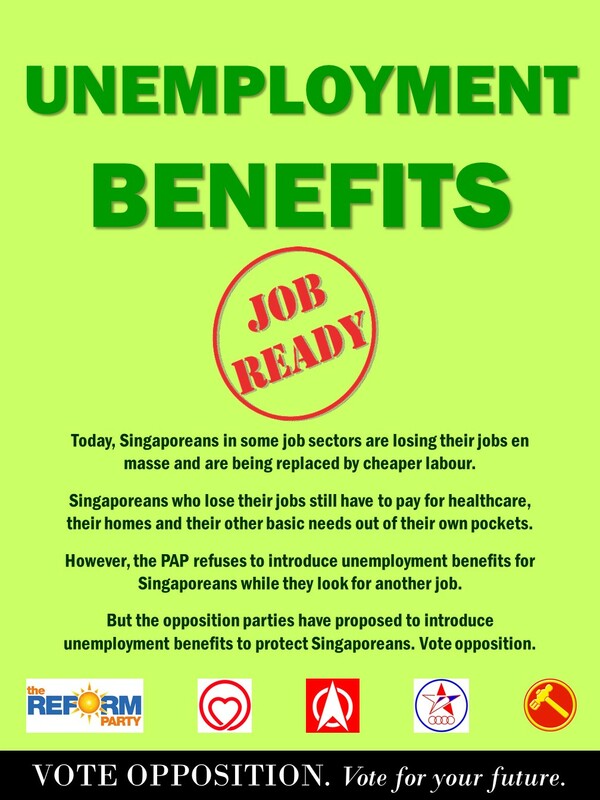 The PAP will not provide unemployment benefits to protect Singaporeans. The opposition have said that they will provide a comprehensive safety net to protect the lives of Singaporeans, so that we can continue to live with peace of mind. With unemployment benefits, Singaporeans will not have to worry about not having enough to survive on. Singaporeans will also be able to look for a job, knowing that their basic needs are taken care of. 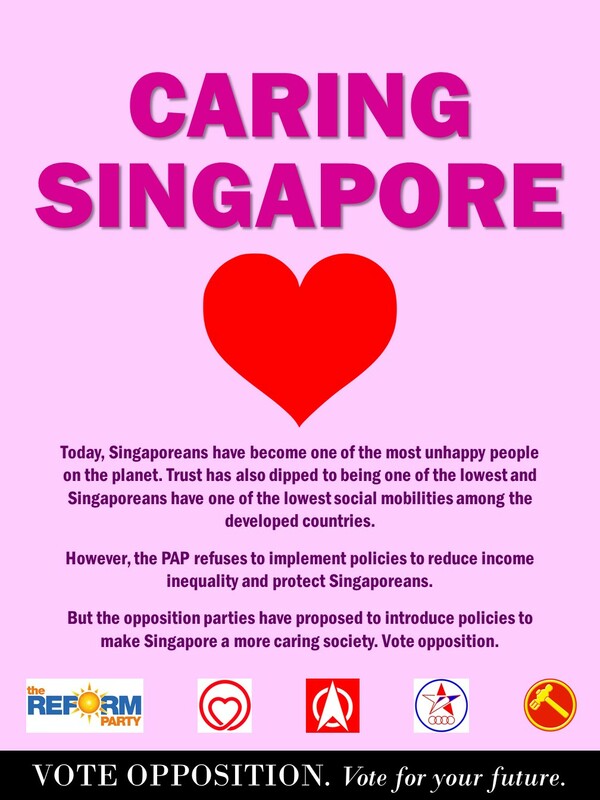 Today, the PAP spends the least on healthcare for Singaporeans, among the developed countries. In fact, Singaporeans have to pay the most out of our own pockets to pay for healthcare in the world, after Switzerland. This is even though Singaporeans earn one of the lowest wages among the highest-income countries. The Worker’s Party has pointed out that, “It is not uncommon to hear accounts of older folks ignoring health problems and delaying visits to the doctor because they fear that medical expenses will be a financial burden to themselves and their families. “In Singapore, less than one-third of all healthcare costs are paid by the Government. More than 60% of costs are paid by patients out-of-pocket, which includes cash and Medisave. This is much higher than the average of 14% in high income countries, according to data from the World Health Organization. “The Singapore People’s Party places a very high premium on the health of all Singaporeans for all illness,” it added. The Singapore People’s Party added: “Perhaps it should be time for the government to take real responsibility over medical cost issues and not simply stop the bucket at the citizen level. Similarly, the Worker’s Party also said: “It is a fundamental responsibility of the Government to ensure that all our citizens have access to high quality healthcare based on their medical needs, and regardless of their income. “The Government must be prepared to shoulder a much larger proportion of healthcare costs than it currently does. We need to shift away from seeing healthcare as primarily an individual responsibility, and emphasise more government intervention, risk sharing and fairness in financing. This is why the Reform Party has said that it will implement universal health insurance and SingFirst has also said that it will implement a heavily subsidised universal and comprehensive healthcare insurance, by having huge increase in healthcare subsidies and to build more hospitals. In fact, the Singapore Democratic Party has also said in its National Healthcare Plan that it only wants Singaporeans to pay a cap of $2,000 every year for hospital bills. Today, some Singaporeans have to pay more than $10,000 for their hospital bills because there is no cap on how much they have to pay. 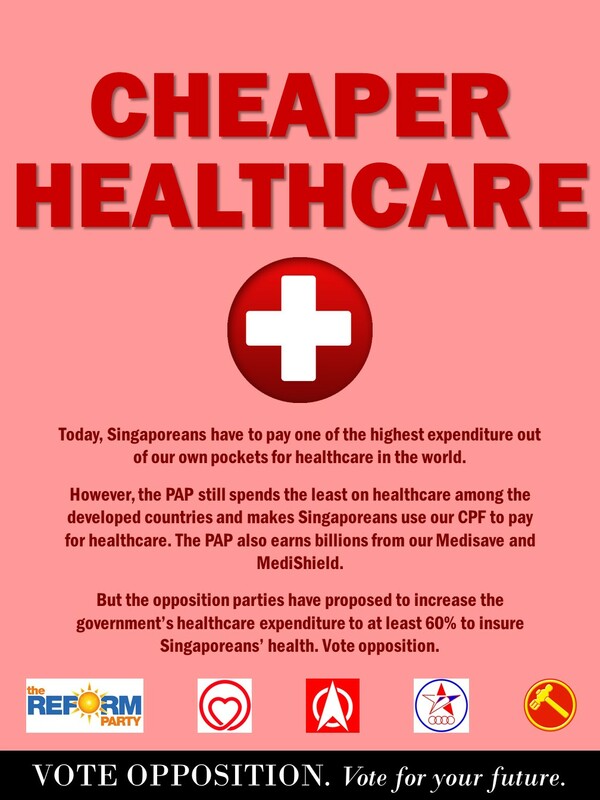 The PAP does not want to increase government expenditure on healthcare to protect Singaporeans. The opposition will increase government expenditure on healthcare so that Singaporeans do not have to pay so much out of our pockets for healthcare and be able to seek out healthcare when we need to, because we can know that we will be taken care of by the government. The opposition will also return the CPF and tax that Singaporeans pay and give it back to us by subsidising the healthcare costs. Today, the PAP spends the least on education, as a percentage of GDP, among the developed countries. In fact, the PAP makes Singaporeans pay for one of the most expensive, if not the most expensive university tuition fees in the world, and possibly the most expensive childcare fees in the world. This is even though the PAP makes Singaporeans earn one of the lowest wages among the developed countries. Not only do Singaporeans thus have the lowest purchasing power among the developed countries, many Singaporeans are laden with heavy debt, to send their children to school. The resources are also unevenly distributed between the schools. Lee Hsien Loong also said that “every school is a good school” but a school’s vice-principal chided him and said that this would only be true if the top public servants would send their children to neighbourhood schools as well. 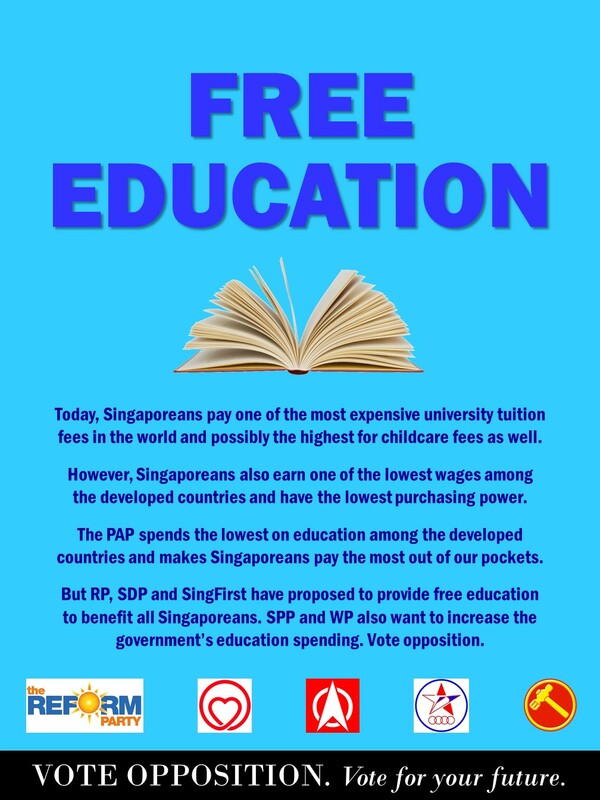 The PAP has more than enough surpluses to provide free education for Singaporeans but it refuses to do so and would instead spend $400 million to pay for foreign students to study in Singapore but would make Singaporeans pay the same amount to pay by ourselves. However, the opposition parties have said that they will take care of Singaporeans’ education. Reform Party’s manifesto said that it would provide “universal free and compulsory education”. A similar call was made by the Singapore People’s Party to make education more affordable. In the Worker’s Party’s manifesto, it said: “The tuition grant for local undergraduates should be increased to better reflect the value of our citizenship and make tertiary education more affordable. “The co-payment portion of the university tuition fee by citizens should be capped at 10 per cent of operating expenditure of local universities,” it also said. The PAP does not want to increase education expenditure to enable Singaporean students to be able to truly afford education. The opposition will not only increase education expenditure but will even make education free. They will also look to provide free childcare and allow Singaporeans to study at our universities for free. This is a mark of a truly developed nation which will invest in their peoples’ education. Today, Singaporeans pay for one of the most expensive public and private housing in the world even though Singaporeans earn one of the lowest wages among the highest income countries. On top of that, after Singaporeans sell off their homes bought with CPF funds, they are required to pay back in part or in full the profits from their sales back in the CPF, to pay for the “accrued” interest. This has infuriated many Singaporeans who are shocked by how they are not allowed to keep the profit from the sale of their homes. Also, housing prices have escalated, first in the mid-1990s and second in the mid-2000s, so much so that housing in Singapore has become unaffordable for many Singaporeans. However, the Opposition Parties have said that they would provide cheaper housing for Singaporeans. Reform Party said in its manifesto that it would aim to provide cheaper and better lower-income housing. SingFirst also pointed out how “Singapore citizens are faced with expensive housing options” and how they have planned to “strengthen welfare services comprehensively and significantly in housing”. On how to do so, the Singapore People’s Party has said, “The HDB was set up to provide affordable public housing for Singaporeans. Over time, government has placed Singaporeans in a pressure cooker. “What is the basis of the increase in price? Have the costs of building an HDB flat increased by 10 times? This is definitely not true. “We will have to push the government to reveal the real costs of building a HDB flat and to ring-fence public housing as a basic necessity for Singaporean citizens,” the Singapore People’s Party also said. Today, of the HDB flat prices that Singaporeans pay, it is estimated that 60% of the money we pay actually goes into land that we do not own. The Singapore Democratic Party has thus proposed that, “HDB flats will be built on land specially zoned for public housing and not contain a land cost component. Giam also said, “Rather than judge affordability based on the ability to pay off their monthly loan instalments, we should look at other ways of assessing affordability. Giam spoke about creating “a new class of the HDB flats” with “prices pegged to three times the relevant median annual household income”. “This will ensure that prices will remain affordable,” Giam said. The PAP continues to want to make Singaporeans buy expensive public housing flats, with the intention to profit off these sales. However, as the opposition parties have pointed out, the HDB housing policy has veered away from what it was intentionally meant for, to provide cheap housing for Singaporeans. The PAP refuses to provide cheap public housing for Singaporeans. 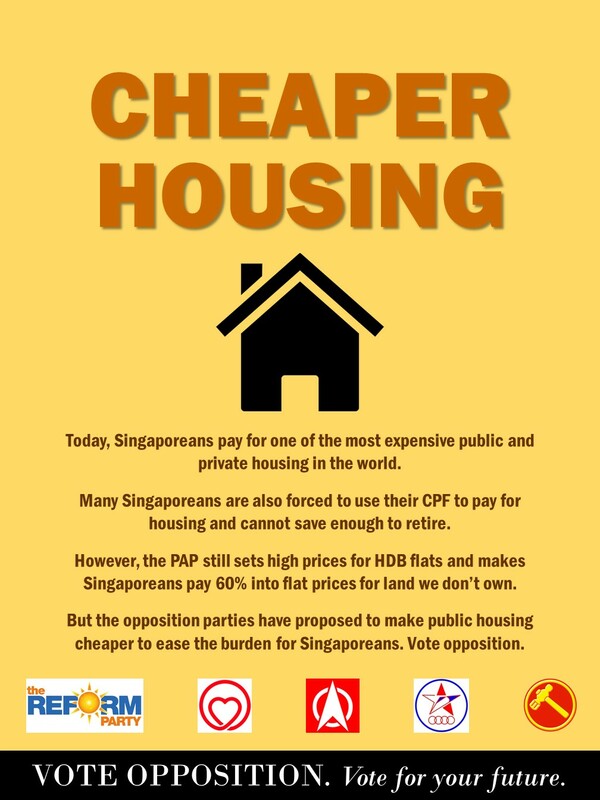 However, the opposition wants to provide cheaper housing for Singaporeans. Today, Singaporeans have one of the least adequate retirement funds in the world, even though we have to pay the most out of our wages in the world – 37% – into the CPF pension system. This is because the government only gives Singaporeans interest rates of 2.5% to 4% on our CPF, which is the lowest in the world. However, the PAP takes our CPF to earn 6% to 16% in GIC and Temasek Holdings, which have now become the top 11 richest sovereign wealth funds in the world. The PAP takes our CPF to earn hundreds of billions but returns the lowest interest rates back to Singaporeans. Not only that, the PAP also locks up Singaporeans’ CPF by setting a CPF Minimum Sum which prevents Singaporeans from being able to take our CPF out. Also, when Singaporeans use their CPF to buy their homes or pay for university fees, they have to pay an accrued interest back to the CPF, losing the profit that they earn from their homes. This has angered many Singaporeans. A BlackBox survey showed that more than half of Singaporeans do not think that the CPF is fair. The PAP does not want to increase wages or the CPF interest rates to grow the CPF and protect Singaporeans. It also refuses to introduce a public pension system. However, the PAP has kept increasing their own salaries and allow the government investment firms to get rich, at the expense of Singaporeans. However, the opposition parties have said that they will protect Singaporeans for our retirement. 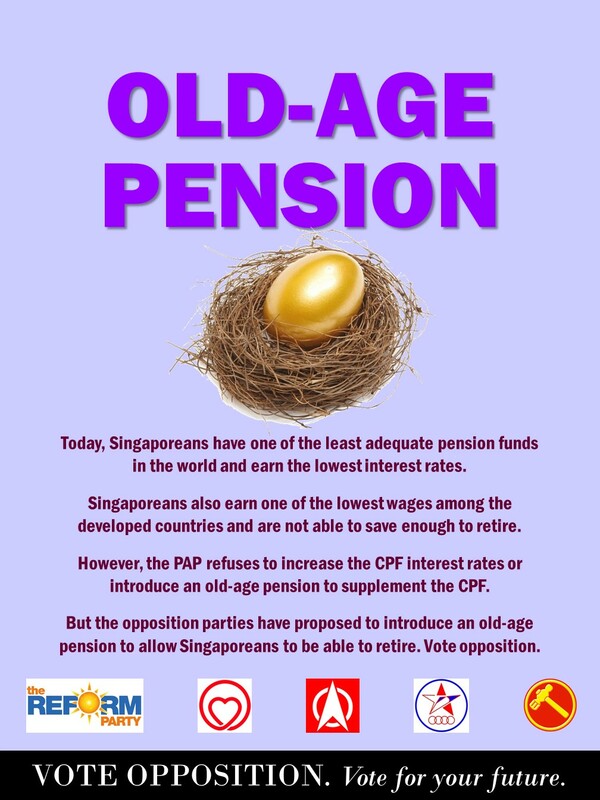 The Reform Party says in its manifesto that it will introduce an old age pension, alongside the CPF, for Singaporeans. SingFirst has similarly said that it will provide an old-age pension of at least $300 every month for elderly Singaporeans. The Singapore People’s Party has also acknowledged that, “Many Singaporeans are also deeply unhappy about the compulsory annuity CPF scheme. The Worker’s Party has also said in its manifesto that, “The government should look at ways to pool the funds together to enable members to enjoy economies of scale when making investments. They can then avoid paying the hefty financial charges incurred should they invest on their own. As such, the Singapore Democratic Party said that CPF savings should be returned in full after retirement. It also wants to increase health subsidies and thereby scrap Medisave so that the “$43,500 withheld to members’ CPF accounts” can be returned to Singaporeans. The PAP continues to want to lock up Singaporeans’ CPF, so that they can take the money to use and earn for themselves. However, the opposition wants to return the CPF back to Singaporeans. It wants Singaporeans to be able to earn enough inside their CPF to retire on. The opposition also wants to protect Singaporeans by introducing a public pension scheme alongside the CPF to supplement Singaporeans’ retirement. The PAP does not want to take care of Singaporeans. But the opposition will. Today, Singapore has the highest income inequality among the developed countries and one of the highest income inequalities in the world. Singapore also has the highest rich-poor gap and poverty rate – estimated to be 30% – among the developed countries. Research has shown that because Singapore has the highest income inequality among the developed countries, this has also resulted in the lowest levels of trust after Portugal, the highest rate of self-centredness, social mobility in Singapore has also become one of the lowest and Singapore also has the highest prisoner rate, after the United States. Indeed, the inequality that the PAP has created has created many social problems in Singapore. Not only that, the International Monetary Fund (IMF) and the Organisation for Economic Co-operation and Development (OECD) have also shown that high income inequality have resulted in low economic growth in a country. The PAP started creating the income inequality in Singapore by reducing subsidies on health in the mid-1980s, and then creating the CPF Minimum Sum, Medisave and MediShield to lock up Singaporeans’ CPF, and by reducing the CPF interest rates. It then increased HDB flat prices and university tuition fees by several times in the 1980s, and then started depressing wages in the mid-1990s, thus creating a lopsided growth in Singapore and exacerbating the inequality in Singapore. As such, today’s social and economic problems in Singapore are, in large part, due to the policies that the PAP have created since the mid-1980s. However, today, the PAP refuses to define a poverty line or implement a minimum wage. Also, the PAP refuses to increase health and education expenditure, even though the Singapore government already spends the lowest on these among the developed countries. Moreover, the PAP also refuses to increase social protection expenditure and implement a public pension scheme, even though the Singapore government also spends the lowest on social protection and Singaporeans have one of the least adequate retirement funds on this planet. However, the PAP would pay themselves and the rich in Singapore the highest salaries in the world, while also letting themselves pay the lowest tax and CPF among the developed countries, and while making Singaporeans pay the highest CPF contribution into our pension fund in the world. Singapore has become very unequal under the PAP. The PAP refuses to change the policies to reverse the situation and protect Singaporeans. However, the Opposition Parties will. The opposition have said that they will increase health and education expenditure, they also said that they will provide cheap housing and implement a public pension scheme, to supplement the CPF. The opposition have also said that they will implement a minimum wage. Once the opposition becomes the government and reverses the PAP’s policies, the Singapore society will also become a better place. Singaporeans will become less self-centred as we have more time to look out for one another, social mobility will increase as more Singaporeans truly get opportunities to advance in life, and social problems will also decrease. There are ways to make Singapore a better place and our society a happier one. All it takes is political will to enact policies to achieve this. However, the PAP refuses to do so. But the opposition will. The opposition parties will reverse the policies by the PAP and introduce new policies to take care of and protect Singaporeans. Vote Opposition. Vote for your future. Now that I have been “influenced” by Roy, my stand is “Vote for the devil you know”. Anyway my token bet still stands. While I do agree that minimum wage is necessary, and I do agree that Singaporean should be given the liberty to choose whether they want to withdraw their CPF in full at age 55, or leave it in CPF account for better interest rate return, my question is : with minimum wage implemented in private sector, will this cause higher unemployment rate due to higher overheads and non competitiveness of these workers? Personally, as a layman, I felt that wages should be in relation with productivity and on a performance basis. Hi, I think that is good. Now you need to print it in big newsletter format and distribute it to every block of flats in the country. RegardsBoh Kia See PS: It needs to be repeated a number of times too. Good suggestion. But he must get help from some editorial volunteers, otherwise it will be just as messy. You need to keep repeating this in your articles every week because there are DAFT people here who do not have the mental capacity to comprehend that the PAP has been lying to them and that the scenario you are painting is “real and present danger”. You have attracted many new readers to your articles. Many may have already decided that they have been lied to by the PAP all along and will NOW vote for the opposition and FREEDOM. 100% agree and keep up the good work Roy….many singaporeans have woken and realized we have been deceived all these years……many will vote for oppositions now……..
Well, to disappoint you guys, i think PAP will gain a bigger majority compared to the previous election. Regarding Roy’s prediction, come on, it is already more or less guessed by most people that Adjunied will be won by the Worker’s Party, no need a genius to predict that. With that said, my personal opinion is none of the other opposition has any credibility at all to compete. Singaporean First – Even bigger joke with Tan Jee Say, firstly SDP, then Presidential Election? Then back to Singaporean First. He seems to be unable to make up his mind whether he wants to be a politician or presidents. political or apolitical. So just the above 2, how to command votes? I still wonder why the pension scheme was abandoned…can look into that please? It is not quite correct to set poverty line at half of average wage. Our minimum wage for cleaners at S$1000 is the salary that fresh degree holders draw in neighbouring Malaysia. So not 30% of Singaporeans live in poverty. We also cannot have unemployment benefits because it would cause people to become lazy and not want to work. Countries that offer social welfare have very high tax rates. That kind of model is not suitable for our country and would make us uncompetitive and unattractive to foreign investors. If you flip through the newspapers, you would find lots of jobs that offer people between S$1500 to S$2500 per month. While this may not seem like a lot relative to developed countries, it is definitely sufficient for survivial especially if you are less skilled workers. We cannot raise minimum wage to those level like other countries that have reached developed world status much earlier as it would cause huge inflation. If we use the Big Mac Index as an example, we would be able to see this very clearly. A Big Mac would cost US$7.54 in Switzerland, US$4.97 in USA, US$4.32 in Australia, US$6.30 in Norway but it cost only US$3.53 in Singapore. Do we want prices of food and basic necessities to shoot up to levels like levels of other developed countries because cost of doing business went up? No right…so we are better off sticking with our current system. One thing however I noticed in Singapore is everytime after a renovation, prices of food goes up. So we should stop unnecessary renovations. I Do Not Want Singapore to Become PAP. This is Not the Singapore I Want.